This conversation on fruit infused water recipes was sponsored by Chef's Mate. We all know that drinking enough water is important, but sometimes we just get bored with plain old water. That is where fruit infused water comes in. 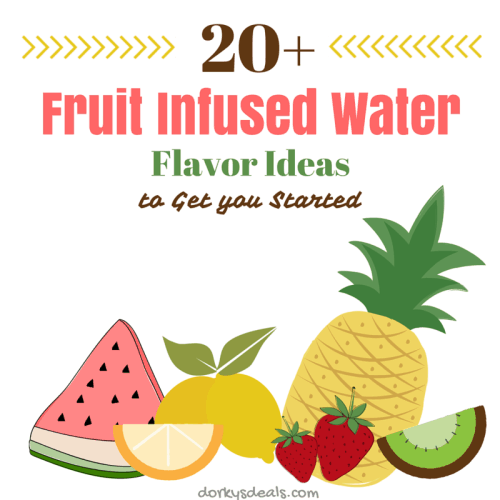 Below are 20+ fruit infused water flavor ideas to get your started. We all know that drinking enough water is important, but sometimes we just get bored with plain old water. That is where fruit infused water comes in. Just place sliced fruit into an infuser pitcher or fruit infuser water bottle and give it some time to sit and absorb the flavor. The result will be a delicious fruit flavored water, sans the added sugars typical of store bought fruit flavored beverages and juices. When I want a drink for on the go I use an infuser water bottle. I fill it with sliced fruit and water and pop it in the fridge until I am ready to go. It should sit for at least 10 minutes, but the longer it sits the stronger the flavor, so making the night before or a few hours ahead would be ideal. My new favorite infuser water bottle is the Infusion8er from Chef's Mate. 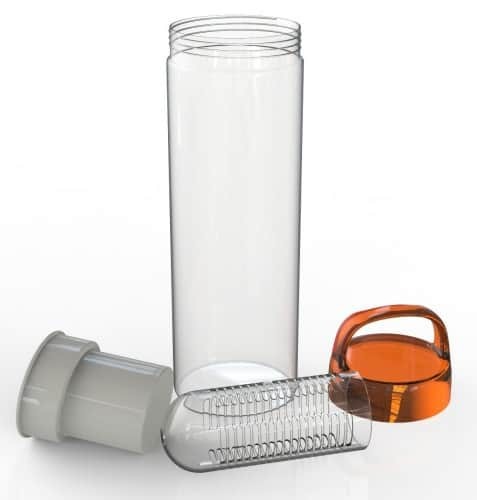 The Infusion8er is made of strong, BPA-Free, Tritan plastic which is virtually unbreakable. It's lid has a loop making it easy to carry, and the lid secures tightly and will not leak even if I toss it in my bag. The bottle's infusion chamber is a nice size, and is easy to fill. Plus the bottle is dishwasher safe, which makes cleaning a breeze. I just take the lid and chamber off and toss them all in the dishwasher. 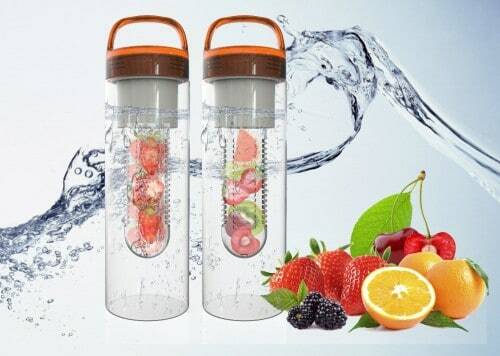 You can purchase the Infusion8er Fruit Infuser Water Bottle on Amazon. Fast 2-Day Shipping is FREE with Amazon Prime (Don't have Amazon Prime? Did you know you can try Amazon Prime FREE for 30 days. I seriously love infused water. I have so many infused water bottles! I love fruit infused waters. It makes boring water so much better. When I remember I generally buy a cucumber, slice it up and infuse that into the water–watermelon is also delicious. I love infused water because it helps me drink more water. Cucumber is my favorite. We’ve been trying to drink more water and have been looking for a water bottle that will keep the fruit separate. These are some great ideas – many combinations I’ve never considered! My favorite is lemon and fresh basil. I need to drink more water. Strawberry Cucumber is my first choice of what you’ve listed. My favourite is mint and lemon!! I love the idea of having fruit infused in the water I’m drinking. It’s important to stay hydrated and this is one pleasant way to do that! This looks like an awesome product. Thanks for the post! Needing to drink more water, I think this would be the perfect way! This is really cool! I’ve never tried one before. I need one of these. I never thought of pink grapefruit infused water but it sounds extra refreshing. This is so cool! I love drinking water, now I will have the ability to drink water with fruits in a cup. I’m so excited about this giveaway? These bottles are great to make water more delicious. A great way to drink more water with fruits. Love that you can take this bottle on the go. I usually infused lemons in my water. Sometimes I will do strawberry and mint. I must try your suggestion of strawberry, lime and cucumber and canteloupe with grapefruit. I love grapefruit so it should be an interesting taste.